Happy Friday the 13th! I actually like Friday the 13th, it’s usually a pretty good day for me and so far this one has been too. The yellow is a semi-solid wool/nylon I dyed in the crock pot for a design I’ve been thinking of. The turquoise is on her wool/bamboo base, and was also dyed in the crock pot. It turned out much more variegated, though. The two flats were a cute idea I had… I’ve been wanting to get some blank flats and paint a star on one – I’m not dumb, I know it won’t come out as a star on the socks, but it’s like… stealth stars! So when we went to the Superbowl Sale at The Purl District and I saw that Flat Feet was 50% off, I decided I’d go ahead and pick some up. The light blue flat was a semi-solid that I thought would work well for painting on, and the darker blue one was just such a nice color. 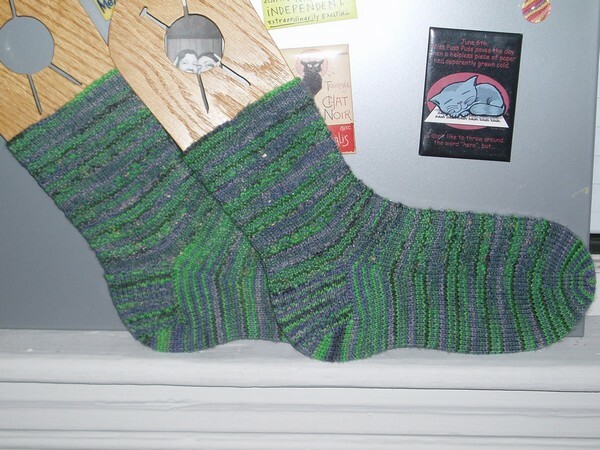 I always think it’s strange when I see Flat Feet with vertical stripes because that’s going to come out just like if you dyed it in a skein – what’s the point of doing it in a flat? So I doctored up the dark one by painting some horizontal stripes – they’re not really going to show up over the darker yarn, but there will be stripes of different colors in the lighter sections. I think it will be a cool effect. For the lighter flat we printed out a star and cut it out, and I painted around / over the paper. Then I spattered the flat with the same blue so that it wouldn’t be only confined to the star area – I think it will add some interest. Both of the flats only show half – the other side is painted to match. Before I left Boston, I lent her a book, a project bag, and gave her some yarn one day when she was at my house with nothing to knit. Perhaps because of that – though I don’t quite remember – she said she’d knit me a pair of Conwy socks. I have a shorter pair that I knit, but I *hated* knitting the pattern. I love the resulting socks, though. She likes knitting the pattern so I gave her a skein of my JKnits and she made me those Conwy socks. I got the package today returning my stuff, sending me the above socks, and with a bonus yarny gift – Aussi Sock which she said I hadn’t tried yet and it was my colors. Right on both counts! Can you see Cathy’s influence on my SPA yarn purchases? 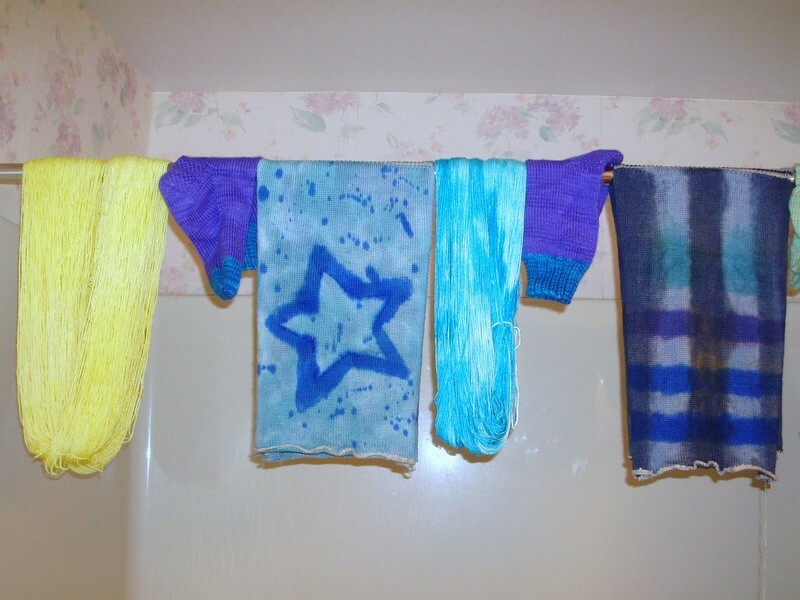 The furthest left is yarn from Dye Dreams – the first booth we stopped in! 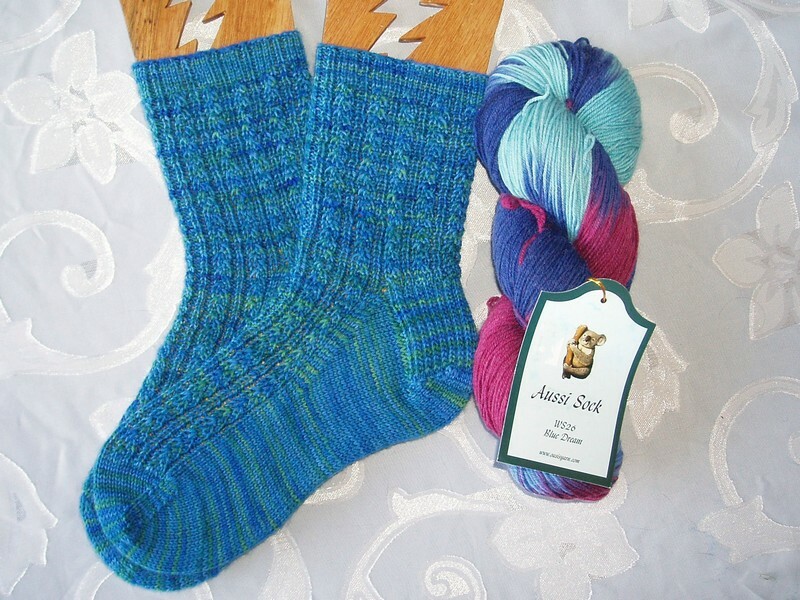 There was a beautiful dark blue-teal yarn that Cathy really liked *shock! * so I got it for her as a birthday gift. Then there wasn’t another for me, so I picked up this blue and pink one. It’s really pretty! The middle yarn is from The Woolen Rabbit and is called Harmony – the color is Black Velvet. Cathy and I were ogling this yarn for both days of SPA and finally bought it Sunday morning when there were only two skeins left. 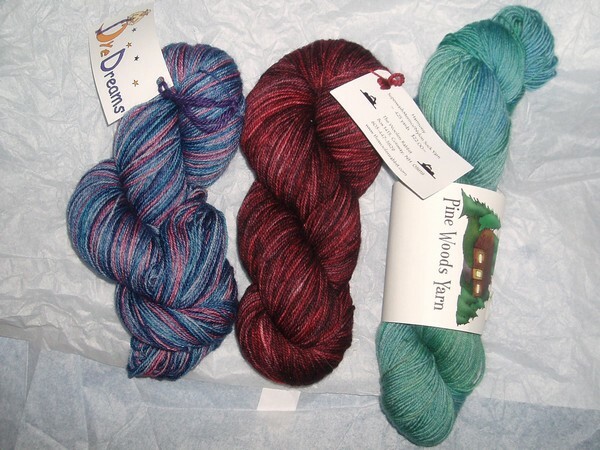 And last but not least, some pretty yarn from Pine Woods Yarn. They’re in Maine and dye on a wood fired stove, and the colors are all unique. There were some multis and even some blue ones but my goal was to stick with semisolid for the most part, so I went with Cathy’s pick of green. So that’s my yarn from SPA, fiber perhaps to come at a later date, or if not then when I spin it for sure! 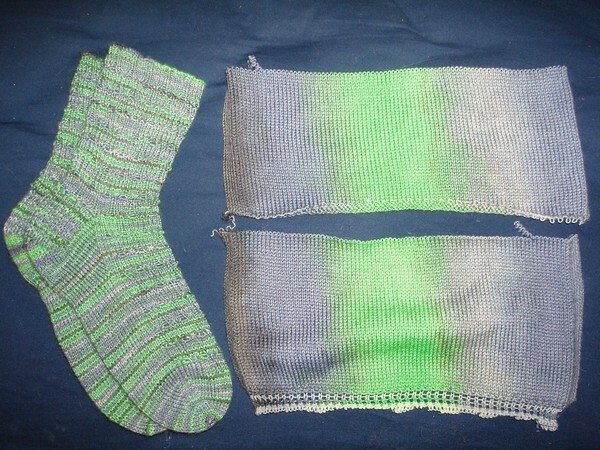 I also started a pair of socks from my new Flat Feet. 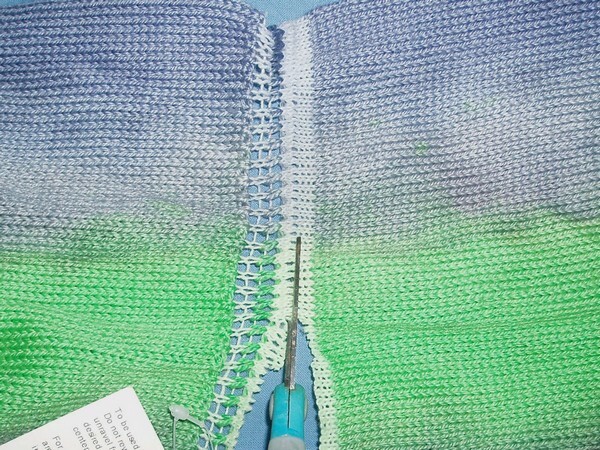 The yarn comes knit into a large flat piece with waste yarn down the middle. Each side is about 12″ x 15″ unstretched. I cut the waste yarn to make two flats so I could knit my socks 2 at once. Then it was time to start unraveling and cast on! 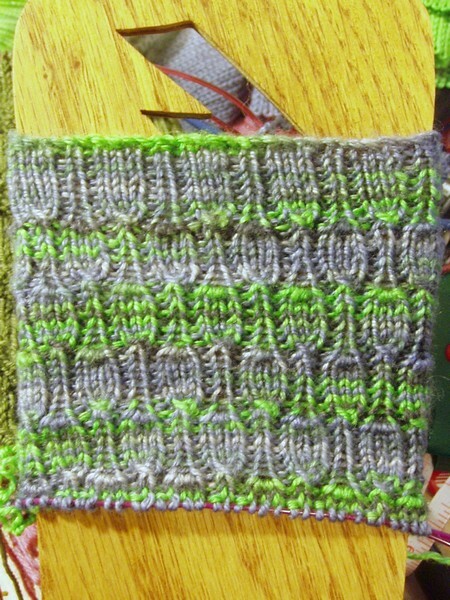 The curlyness of the yarn was a little annoying during the cast on, but not too bad. While I knit it doesn’t bother me at all, but I think this probably has something to do with my knitting style. I knit continental so I don’t drop the yarn between stitches and I keep it at a pretty good tension so the part I’m working with is pulled taut and not curly at all. 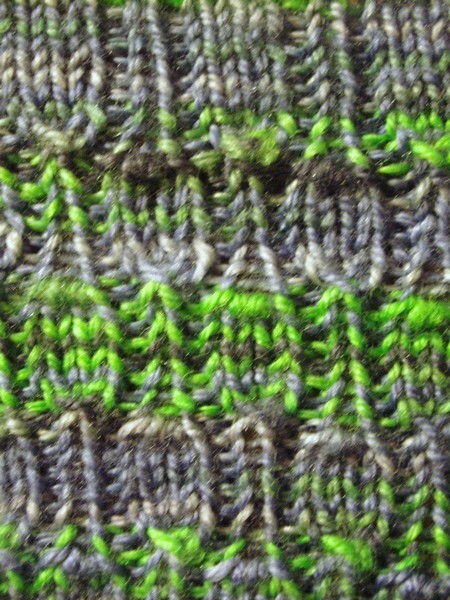 I can imagine if you are dropping the yarn between stitches then the frogged yarn could be really annoying.